Parathas are sustaining and wholesomeand they are the staple food for most North Indians. . 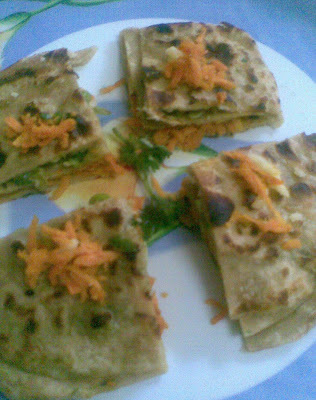 I love stuffed parathas and so I prepare it often with different stuffings. There is another convenience in making stuffed parathas. You don’t need to make any gravy or curries for this as we do for the regular chappathi.We can Served with curds and a pickle. 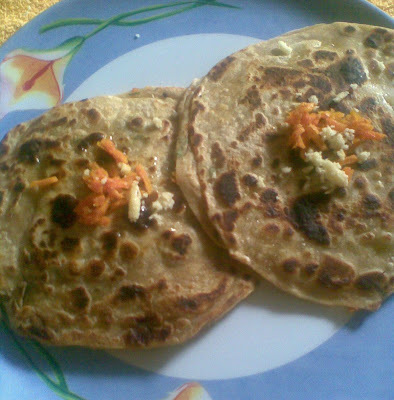 you can make your own paratha using the different options of stuffing available. There is also an option of single / double layer i.e. whether you want the stuffing to be open on one side or completely covered.This time I made double layer parathas with carrot and peas stuffing. 1.Heat the ghee and add the cumin seeds. 2.When they crackle, add the green chillies, corianderpowder,cumin powder and salt and cook for 1 minute. 2.When they crackle, add the carrots, corianderpowder,cumin powder green chillies, lemon juice and salt and mix well. 3.Cover and cook for 2 minutes. Keep aside. 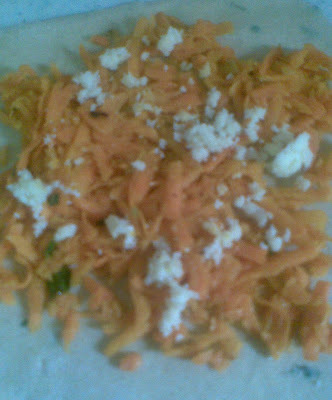 2.Place one uncooked round of dough on a flat surface, spread 1 tbsp of the carrot stuffing and cover with a cooked roti. 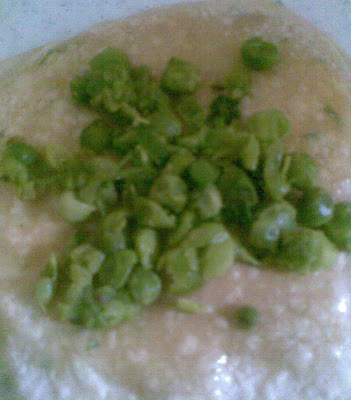 3.Spread 1 tbsp of the green peas stuffing, put another uncooked round of dough roti on the top and press firmly to seal the edges. 4.Cook the double layer parathas on a tava (griddle) on both sides with a little ghee. 5.Cut into wedges and serve hot with pickle, curd or tomato sauce. Looks tasty and healthy. Double layered ummm i gonna try this soon. Thank you priti,Kitchen Flavour ,purva, suma& sireesha. It is healthy and gud option for kids to eat veggie.. I love the simple stuffing you used jaishree.Looks like very easy to make.